I was a boy educated in the classy halls of public school. A land where kids thrived on pushing the limits of rules. Talking back, chewing gum, ignoring teachers - everyone had their methods. In high school it escalated. The guys clung to baggy pants and brands names in a struggle for attention. Stripping down and showing more skin was the female approach. You sadly were labeled for what you wore - thug, punk, skater, trashy, nerdy, etc. Where did I fit into this? High school had me jumping around from trend to trend. Baggy denims and tees one year, followed by khakis and silk screen shirts (that I made in my graphic arts class) the next. There was clearly no order in those days. 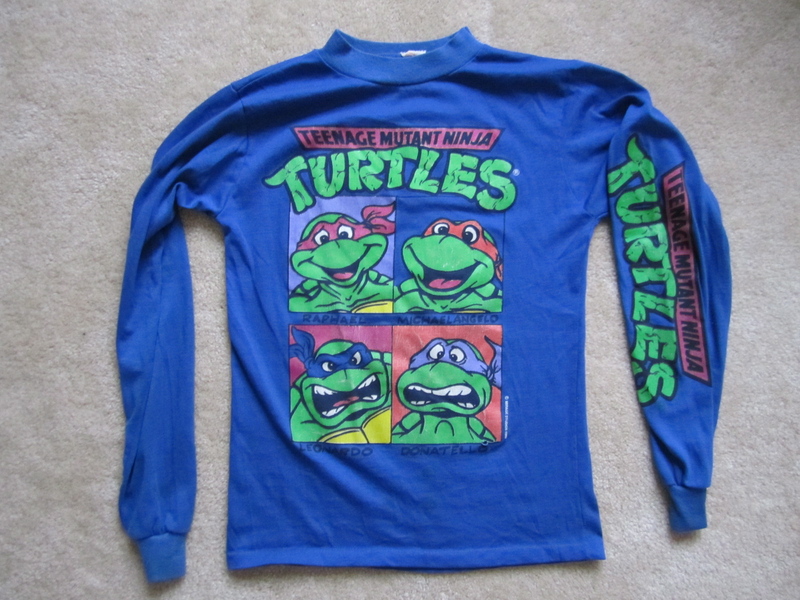 BUT, in the elementary school years, you could say I had a uniform of my own - TMNT-issued. Prepare yourself. You're about to step into a fashion time warp. You will see colors and designs that have escaped your memory for the last couple decades. This is not for the faint. If you have any fashion-sense at all, it's not too late to turn back. Step into the fitting room for the ultimate, in-depth Ninja Turtles Wardrobe Guide! Since you had the guts to keep reading, lets start with something pleasant. Our first piece of apparel has simple artwork with a couple colors on red fabric. The Ninja Turtle branding is also subtle - no in your face TMNT logos. It's not too goofy either. Hands down, this is my favorite. The second is a three color print on gray fabric. 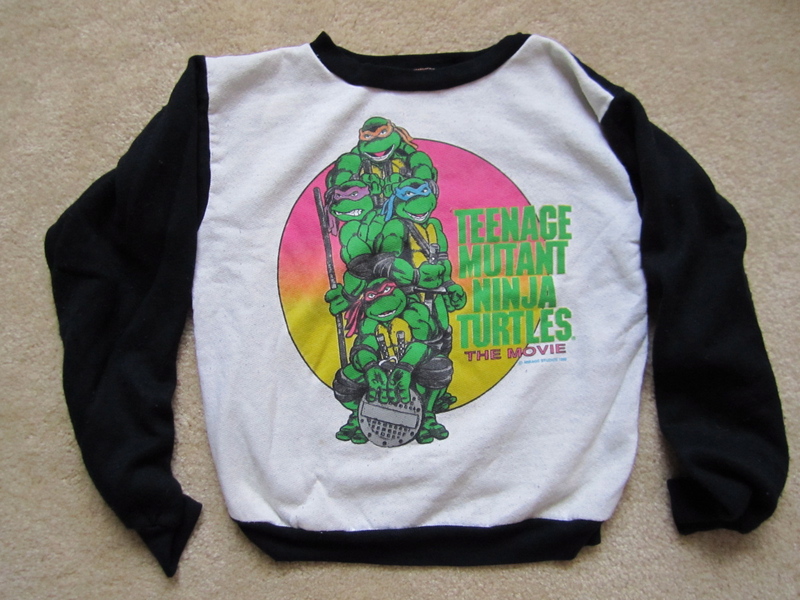 I love movies and Raphael is my favorite Turtle, so this shirt is a win win for me. The film strip in the background is a clever way to brand the TMNT movies without listing a particular title. Raphael also looks quite grand - like he just made an inspirational speech. However, my eyes always seem to drift to one particular thing. That over-sized sai. Raphael's weapon of of choice is bigger than his entire body. This baby is fantastic. We have Shredder being completely menacing on a teal t-shirt (can you be a frightening villain when you're on a teal shirt???) He's shaking his fist, yelling like an old man at the punk kids on his lawn. The Turtles do seem to be making a run for it...Maybe all those years of clashing could have been avoided if the Turtles just got off ol' man Shredder's property. RADICAL! Wow. They made that word really big on this shirt. It's actually bigger than the TMNT logo. But, have no fear! It's all okay because there is a Raphael stamp of approval on the sleeve. Thank God. I got real nervous there. The Ninja Turtles live in the sewers of New York City. Well, this shirt apparently depicts their Jersey Shore weekend getaway. Somewhere on their adventure they even managed to rent some jet skis! Winters are just as cold when you're a kid, so you need to be prepared. Long sleeves and sweaters add warmth. And more hilarity in this case. High three! This purple shirt is actually pretty fun, with Leonardo & Michelangelo giving their version of the high five. I like to think it's because they shared that jet ski on the other shirt. The High Three shirt does have a creep factor though. Look at the collar. Its like it wanted be a turtleneck, but then gave up. The result? Awkwardness. If anyone ever made fun of me for wearing this shirt, it was just. All four Turtles make an appearance on this shirt in a Brady Bunch-like grid. So what's the story of these lovely Turtles? Donatello might just be paranoid. Why is he so scared? 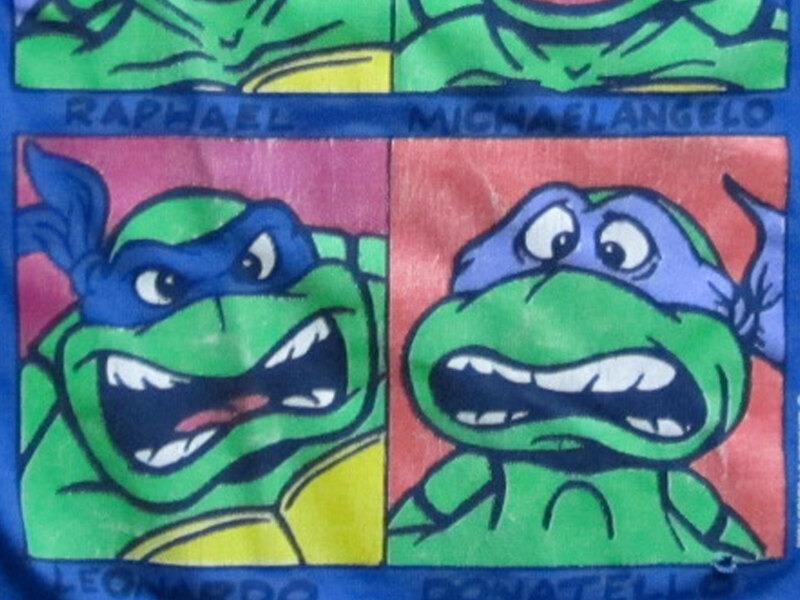 Maybe it's because Leonardo looks like he's going completely insane. Holy cow...we've got a sweater. Someone really should have beat me up for this one. There's just so much going on it makes my eyes hurt. And it makes them hurt twice as bad because it has a design on the back too. I'm going to go out on a limb and say this is still cool. We're treated to the more mature, movie versions of our heroes. They've got attitude. This little number acted as both pajamas and a Halloween costume. It's perfect for a kid - automatically transferring you into your favorite Turtle. Honestly if this still fit, I'd wear it. Maybe I should do an eBay search for an adult size. This monstrosity debuted in my last entry. After hours excavating basement boxes, the prized treasure made its first appearance after a twenty year hiatus. It's as amazing (and terrible) as I remembered. The patchwork is stellar and displayed in a fighter pilot-like fashion. By the heart there's an incredible patch featuring Donatello manning the Turtle blimp. 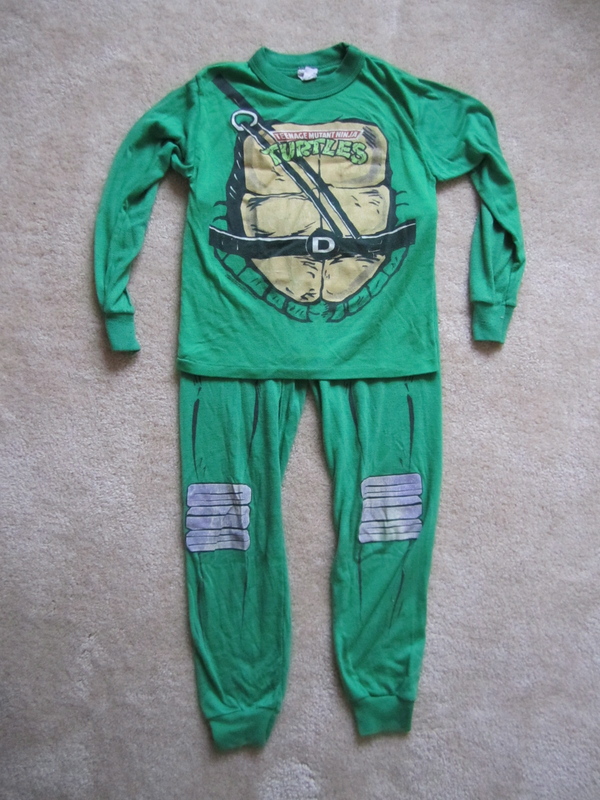 A TMNT logo is sewn on the right sleeve making the jumpsuit completely legit. Cap it off with an image of the brothers on the back. Even if the world was about to end, this thing would still make me smile. There are moments when an outfit requires a little style above the neck. This TMNT painters hat features the Turtles in a cool hybrid between the 80's cartoon and the original comic book version. It has a fun, homemade vibe about it too which gives it an extra boost of amusing charm. This hat gives you the ability to put eyes on the back of your head. The design makes sense - give the kids another opportunity to feel like a Turtle. However, I wonder why the decision was made to make this cap blue? Why not green? You know...like a turtle..? Simple, yet hip headbands. Both feature the movie-inspired TMNT logo. The green one came with my pajama set. The purple, however, involved a little more energy to acquire. After saving up enough Pizza Points (tokens on the back of TMNT merchandise, mostly toys), I sent away for this purple bandanna. More Pizza Points got me a TMNT Fan Club Membership, which included this bandanna. Although it features the 80's cartoon logo, it showcases the Turtles in their original, comic book form. Plastic and elastic. Stretches to fit your waist and fastens on courtesy of a Raphael buckle. This belt has a bit more class. 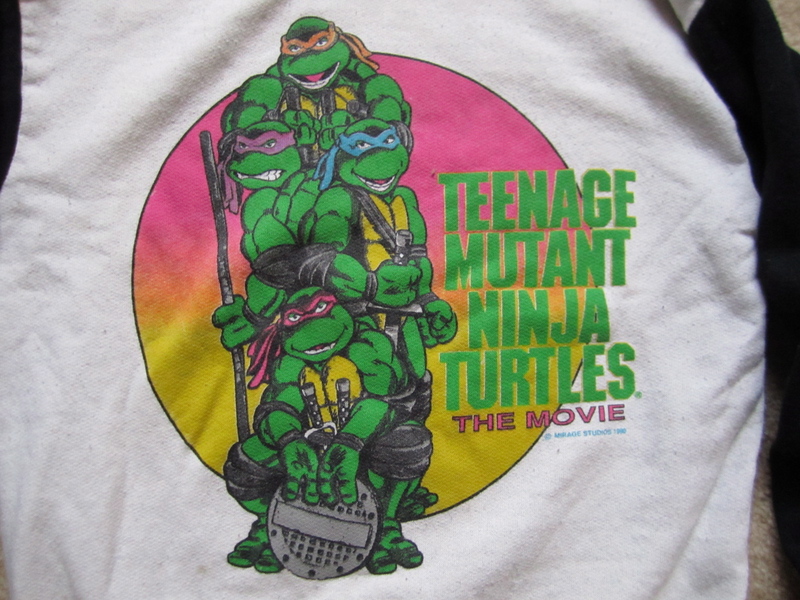 Manufactured by Lee, the print is very vivid and features all four Turtles. A simple, yet pleasing buckle keeps it fastened. Shocker - it's also made with real leather. 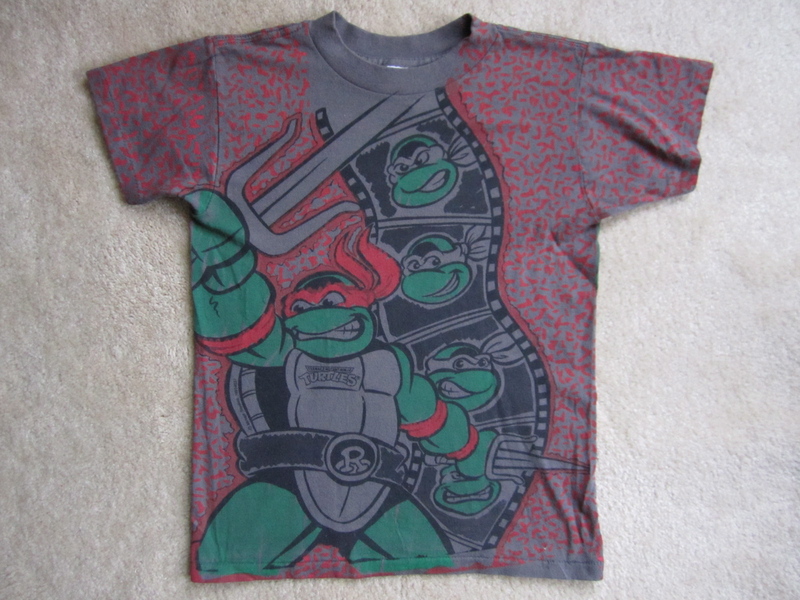 Overall, it's a pretty quality piece which you don't see with all TMNT merch. The first wardrobe debate between me and my parents surfaced when I was presented this shirt. I refused to where it. Why? Raph is my favorite Turtle. RAPH. Not RALPH. Clearly a cheap imitation that was picked up from some bargain rack. 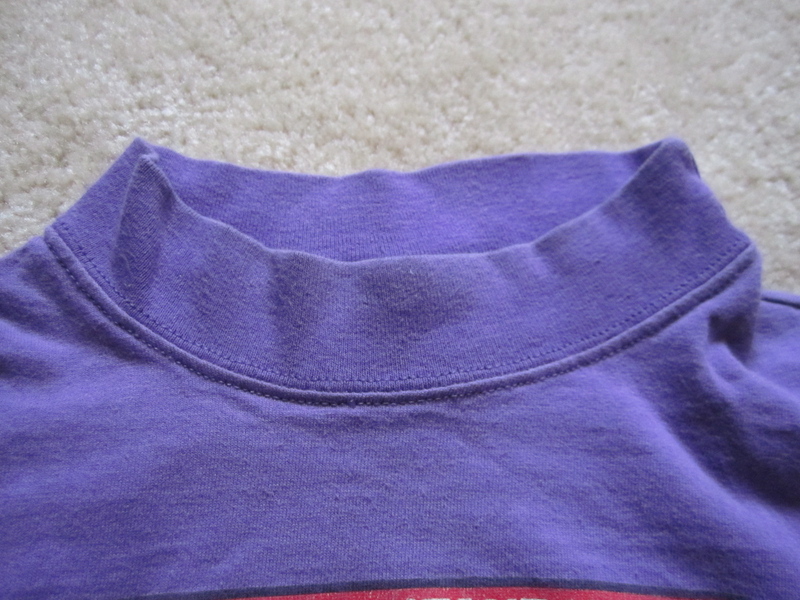 All official TMNT clothing has a specific label on it featuring the logo and Raphael's face. Every shirt, sweater, and jumpsuit you've seen so far has featured this logo. The Ralph shirt, however, features this logo. Wormser?! Not so official. Although a cheap knockoff, at least I feel better knowing it was Flame Resistant. Eat it up, ladies. Here's what I was rockin' as a young stud. They're awesome and you know it. And that about wraps it up. Welcome back to modern times. Thank you for taking a journey through my wardrobe of the yesteryear. It's been wild. 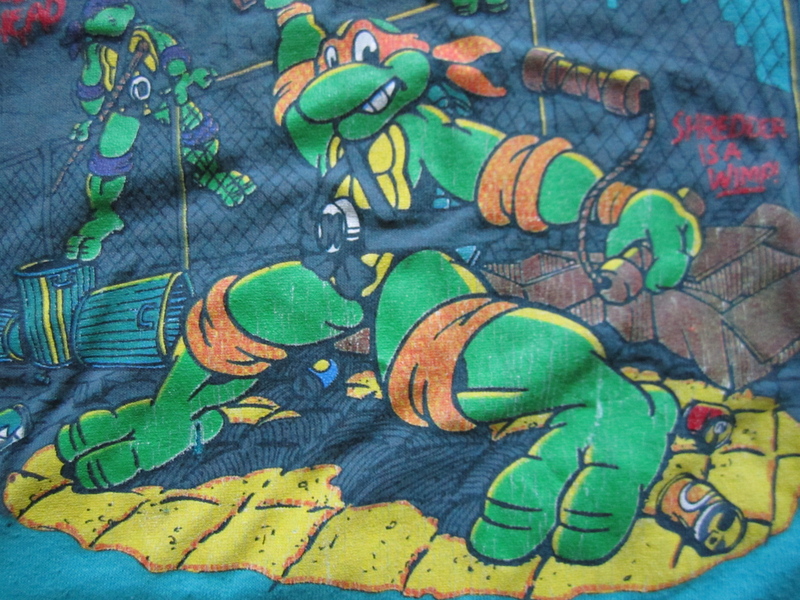 This heap of fashion is now displayed in The Sewer Den, the cowabunga catwalk. I'm pretty sure you could still fit in most of those shirts. And the sweater is bloody brilliant! Ah, what memories. It was fun being a parent in the heyday of the Ninja Turtles. I glad I wasn't a Barney-era parent. Hey, I love your new blog. I'll be reading regularly as long as you keep it going. It's pretty exciting to be in on it at the ground floor, thanks to retroist.com. The headband logos, actually, aren't the movie logo. The J slant and the slightly different typeface betray this as the logo for the original black and white Mirage Studios comics. I owned about half the clothes you had!! man, this is freaking awesome lol. good'ol days. -->> HOW AWESOME IS THIS WARDROBE !? ! !